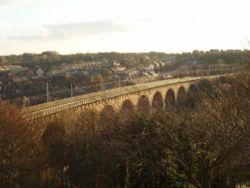 The East Coast Main Line viaduct at Durham. The suburban branch line from London's Moorgate station to Stevenage, via Finsbury Park and the Hertford Loop. Differing from the Network Rail definition the ECML is sometimes regarded as extending beyond Edinburgh to Aberdeen, running mostly right on the east coast via Kirkcaldy, Dundee and Arbroath. North of Edinburgh it includes the world-famous red cantilever Forth Bridge, and at Dundee the curved Tay Bridge both crossing wide river estuaries. The Edinburgh to Glasgow Central via Carstairs and Motherwell line is an offshoot of the ECML because many services from between King's Cross and Edinburgh Waverley use this route beyond Edinburgh. In 1983 the opening of the Selby coalfield saw the line diverted between Colton, just south of York, and Temple Hirst, just north of the M62 motorway crossing. The ECML is one of the fastest railway lines in the UK, most of the line being rated for 200 km/h (125 mph) operation. Current UK legalisation requires in-cab signalling for speeds of over 200 km/h and prevents the InterCity 225 train-sets from operating at the Class 91 design speed of 225 km/h (140 mph) in normal service. Before the present in-cab regulations came in, British Rail experimented with 225 km/h (140 mph) running by introducing a fifth, flashing green signalling aspect on track between New England North and Stoke Tunnel. Still observable in normal service, this fifth aspect appears when the second block ahead is also green, representing an increased clear section distance necessary to brake from 225 km/h with the fitted braking technology. Locomotives have operated on the ECML at speeds of 260 km/h (160 mph) in test runs. The relatively high speeds are possible because the ECML travels on straight track covering the flatter, eastern areas of England, though Lincolnshire and Cambridgeshire. In contrast, the West Coast Main Line (WCML) has to traverse the Trent Valley and the mountains of Cumbria, leading to many more curves and a lower general speed limit of 110 mph (175 km/h). Speeds on the West Coast Main Line have been addressed in recent years with the introduction of tilting Pendolino trains and and upgrades to match the 200 km/h (125 mph) speeds available on the East Coast Main Line. The line was built piecemeal by many small railway companies, but mergers and acquisitions led to only three companies controlling the route, north to south the North British Railway, the North Eastern Railway and the Great Northern Railway. In 1860 the companies established the East Coast Joint Stock for through services using common vehicles. In 1923 all three were grouped into the London and North Eastern Railway (LNER). The ECML has been the backdrop for a number of famous rail journeys and locomotives. The line was worked for many years by the famous steam locomotives "Flying Scotsman" and "Mallard": the latter was officially declared the world's fastest steam locomotive on the Grantham - Peterborough stretch, a title it holds to this day. Steam locomotives disappeared in the early 1960s, being replaced by diesels, firstly the legendary dual-engined Deltic locomotive, which remains the most powerful diesel electric engine ever built in the UK. This was replaced by the InterCity 125 or "HST" (High Speed Train), introduced between 1976 and 1981. The cuttings and tunnel entrances just north of King's Cross make a memorable smoky appearance in the 1955 Ealing comedy film The Ladykillers. Also during the 1950s, the line featured in the advertising short Elizabethan Express. Later, the 1971 British gangster film Get Carter features a journey from London Kings Cross to Newcastle Central Station in the opening credits. In what was seen by many as a surprising action for a Conservative government, the ECML was electrified in the late 1980s using state money. The electrification work began in 1985 and the initial section between King's Cross and Leeds went into operational trials in 1988. The full electrification was completed in late 1990, and the current InterCity 225 rolling stock was introduced. Diesels still operate on the ECML - Virgin's Voyager (operating CrossCountry routes), Hull Train's Pioneers (Kings Cross - Hull) and the older HST sets working services north of Edinburgh towards Inverness and Aberdeen. Midland Mainline also operate a limited service of HST's over a portion of the route between Doncaster and Leeds. The ECML is one of the busiest lines on the rail network and there is currently insufficient capacity on parts of the line to satisfy all the requirements of both passenger and freight operators. Although it has four tracks south of Peterborough, a major bottleneck remains in the twin-track Welwyn Viaduct just north of London. There is also a flat crossing with the Nottingham-Lincoln line just north of Newark station. There is often congestion south of Newcastle, which has led to proposals to reopen the Leamside line to passenger and freight traffic. There have been other criticisms - according to Christian Wolmar's book On The Wrong Line, costs were allegedly cut on the late '80s electrification project to the point where the overhead line equipment was built to an inferior standard to that on the WCML. As a result, heavy winds frequently bring down the power lines along the route causing serious delays. However with the escalation of costs in the Industry - particularly caused by the overspend on the WCML modernisation - this was scaled back by the SRA. The only major parts of this to survive were 'Leeds 1st' and the Allington Chord Line. The Newark Dyke Bridge was also replaced. Some minor incremental capacity improvements may also take place at a later date. Abbots Ripton, 21 January 1876 - 14 people died when the Flying Scotsman crashed during a blizzard. Grantham, 19 August 1906 - 14 people died, unidentified cause. Connington South, 5 March 1967 - 5 people died and and 18 were injured when an express train derailed. Hatfield rail crash, 17 October 2000 - 4 people killed, 15 injured when an InterCity 225 derailed. The accident's aftermath had grave consequences for the privatised infrastructure company, Railtrack. First Capital Connect: commuter services between King's Cross, Peterborough, Cambridge and King's Lynn and between Moorgate and Stevenage via either Welwyn Garden City or the Hertford Loop. The Office of Rail Regulation has given permission for Grand Central Railway to run a service from Kings Cross to Sunderland, which is expected to start in 2007. This page was last edited on 26 September 2007, at 18:36.